Kimberly Williams, R.E. 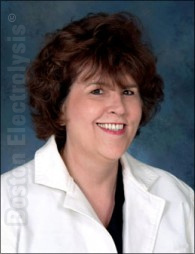 is a Massachusetts Licensed and Registered Electrologist and was the first computer electrology specialist in America.® She was educated in electrolysis at the Kelly School of Electrology in Quincy, MA, with intense studies in the medical field consisting of Theoretical Medical Science and Practical Application. After graduation, Kimberly opened a private practice in Massachusetts and gained an outstanding reputation in professionalism, results, and competency. She employed only registered, licensed electrologist graduates and built one of the largest electrology offices in the state. Kimberly was a guest lecturer at Harvard Medical School from 1983 to 1987. She is also the author, editor and publisher of Volumes I, II, III, IV: Scientific Electrologist©, The Electrologist's Encyclopedia©, Volume 1: The Electrologist's Diagnostic Case History©, and Volume II: The Electrologist's Insertion Guide©. Kimberly is extremely adept in the computer technology field and is a former distributor for computerized medical grade epilators, which is an important factor in choosing the most efficient and advanced equipment for the patient's electrolysis. She guarantees them. Four years of education, over 23 years of experience, state-of-the-art computerized equipment, and a sincere desire to educate the public regarding electrology have placed Kimberly at the top of the electrology field!